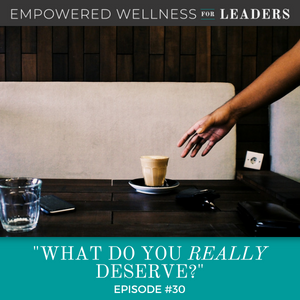 Ep #30: What Do You REALLY Deserve? Today, I’m really excited to talk to you about a word that we all use on a regular basis, a word that often brings the opposite result into our lives. I’m talking about the word “deserve.” This word has such a powerful impact and if used improperly can cause a lot of problems for us. Do you REALLY believe that you deserve a comfort-food meal or drinks after a hard day’s work? Or do you believe you deserve to relax and skip the trip to the gym? On this episode, we explore the reasons why the things that you think you deserve aren’t bringing you the fulfillment you’re really looking for. We also take a look at the things that we REALLY deserve in our lives and why, and I show you how a small change in your thinking can help you get exactly what you need in just about any area of your life. The common misconception about the things that we deserve in life. How to determine if you’re doing the ‘wrong’ thing to solve what you most want. An exercise to help you with this process. Get on the list for my FREE Mindset Booklet! Like my Facebook page to watch my Facebook Live videos. Welcome to Empowered Wellness for Leaders, a podcast that teaches CEOs, entrepreneurs and sales leaders how to deal with the unique challenges of balancing a high-stress career, family, AND their own health. Here’s your host, Certified Executive Wellness Coach, Diana Murphy. Well hello there. I am so excited about speaking to you today about a very common word that we all use that, so many times, brings the opposite results we want in our lives. The word is deserve; not dessert, although that’s always fun, but deserve. This word has a powerful impact. We deserve great things in our lives, right. I really do believe that. It’s a powerful word and it will give you some clues if you look at where you use it. Does this happen to you? You’ve had a really intense day at work, you had a short night and you’re tired, and by 3pm, you find yourself saying, “I deserve a break.” And it becomes a caramel coco-cluster Frappuccino kind of break at Starbucks in the afternoon? Me too. And we do deserve a break. But maybe the break that you and I chose in the Starbucks moment gives us a brain-freeze and a sugar-drop in the afternoon instead of a true break, right. I hear this often in my coaching conversations and I’m going to share with you what I do, what we do, in those coaching moments. Let’s flip deserve on its head by taking actions that really give us what we deserve and want; breaks from work, moments to celebrate, rest and vacations, and time away without work and really healthy bodies. I hope I’ve got you thinking. When do you say, “I deserve?” And for you, is this word leading you to unintended behavior? What this comes down to deep down is we do know that we deserve vacations, rest, promotions, great recognition, celebration, great relationships, fun in our lives, joy, for that matter, just to name a few. But when we keep denying ourselves of those things, it comes up in the trickiest of places. And isn’t it true that we give ourselves permission and justify engaging in naughty behavior when it comes to health habits? There’s nothing wrong with drinks after work or a joy-eat every once in a while, or eating just for pure pleasure, but is that what you really deserve? These moments disrupt our health. I deserve to celebrate means margaritas and all the chips plus a combo platter with friends after good news at work. Or I deserve to relax means eating and drinking anything you want after a hard day and skipping the gym. Stick with me here. What’s beautiful about how our brain processes our words is that the deserved statement will always have some truth in it. But in some cases, we just might be grabbing the wrong thing to solve what we most want. Because if I’ve learned anything as a coach, it’s that when we are denying ourselves great self-care, it’s going to show up somewhere else. And whether we realize it or not, using food and alcohol serves as a cheap and poor substitute for feeling good. It isn’t lasting and it just doesn’t give us the results we really want and deserve. And this isn’t calling you out, like that you’ve had this behavior and this habit; this is all about understanding and getting curious about what’s going on. And how I define these results are that it’s simply misapplied or misdirected self-care. There’s something we’re really wanting and we’re just using the wrong things to feel better. Going back to the Starbucks example, you know, think about the times that this happens. you’ve been working long days, you’re pushing yourself really hard. You look for the relief and the caffeine and sugar break, but you’re not really getting to the bottom of what you really deserve; a break and maybe some rest, right, on a long hard week. It can be as simple as noticing this and planning your day with some margin in between meetings. Or it might be that you’re craving a vacation that you put off for a year, or you’re taking work home way too often and not getting the mental break that weekends were meant to provide, or even your evenings. Let these moments show you that something just might be a little off or needing your attention. Look for the pattern, look for the deserve statements and dissect them a little bit. This pattern is so clear to me now, but was part of my season of gaining weight. And it was a real pattern for me, not just a once in a while; that’s what I want you to notice here. And it was really not taking good care of what I really wanted or deserved in my life. I would wait until the kids were down for the night. I would nibble all through the early evening of their kid’s meal of hotdogs and mac and cheese, but waiting until they got to bed until I could have that me time. And for me, this meant my favorite frozen pizza – even though right by this time, I was not hungry anymore – a big glass of wine and my favorite TV show. Nothing at all wrong with the plan. This was all out of, “I deserve to get some time and splurge by myself and treat myself.” But, this was also when I was at least 30 pounds overweight and beating myself up about the pattern. So this was not working. I really would wake up and shame almost every morning around this and be upset with how I’d eaten the whole pizza. And it did not bring to me what I was most craving; some quality me time and taking care of myself in a new way. I did deserve some personal adult time, but if I’d stopped in the middle of this pattern, this abusive pattern and sat down and asked what I really deserved, this is what I would have told you. I would have said, even in that moment as an at-home mom, inspired reading, a healthy body, no more abusive self-talk, by the way, and eating something more like an adult for dinner. Okay, where was coaching then, my friends? This is where we get an opportunity, we notice a pattern, we notice something that’s not working for us, like drinks every day after work because we’ve had such a hard day or stress is so hard on us. This is where we flip the deserve on its head. This is when I deserve a break becomes learning to block your time and even get outside during the day. Take some quick mini-breaks. Or leaving work at work and be home when you’re home, taking vacations, grabbing a day off here and there when you feel like you and your family might need it. Or just you need a personal rest day or planning times with friends, doing something you absolutely love. Or “I deserve to celebrate.” Instead of the big food gorge and having a hangover the next day or a big drink-fest – a lot of us celebrate big events drinking and hung over for a full day. So instead, this might mean taking some planned time to truly celebrate, designing your own birthday party, splurge on something you had your eye on; celebrating your wins over coffee with a good friend of finding a mentor to make sure that you’re taking that time to celebrate and grow the way you want to. Or, “I deserve to relax.” Means getting enough rest – it usually starts there – and not working on weekends and shutting down your work and giving yourself recovery time, which I’ve kind of mentioned. Isn’t it absolutely fascinating that pour deserved choices, when they come, are all about overeating and overdrinking and they actually end up punishing us instead. We end up with the hangovers and the extra weight on our body. We don’t deserve that, by the way. We don’t. Why do we do this? So again, really stay curious here. If you’re noticing something, if this is bringing something up for you, give yourself some grace first. We live in a culture full of food being used for entertainment instead of fuel; donuts at the office because of a new employee, celebrating with drinks after work, big birthday parties that are all about drinking. It’s just part of our culture, so it’s very natural to fall into this pattern, but let your awareness of where you just suspect it might not be working for you, let that be a place of starting point for you. Not to beat yourself up, to just be aware. What are you really craving? What do you want to do instead? Look and ask what you’re missing. Are you simply leaning into food and alcohol more in your life to create joy when you’re actually just craving that in your life? What lights you up? What are some things that you’re not doing? I was hosting a retreat and we got talking about activity. We’re really talking about working out, but I asked – I love this question – how do you love to move your body? And dancing came up. And I find out very quickly that one of my attendees knows about all these dance clubs. And this isn’t pickup joints; this is really good dancing. I’m like, where was that? I’m so glad I learned about that. Do you see how that lights me up? There’s something that you might be missing and food is just a really cheap replacement. So what do you deserve? What are you craving? Answer those questions and take some steps to honor that. When you honor your natural desire for play, time off, good health, new adventures, it’s fascinating how the draw towards foods just naturally lessens. Isn’t it fascinating that my journey to be a coach started with learning and understanding why I was leaning into food instead of leaning into what I wanted in my life? Like, that is literally where this all started. I had no idea I had a business in me. So when most people are planning their retirement, I’m ramping up and loving this business. So just notice, how do you do this? It really can be just noticing. So take these steps – start so simply. Whatever came up for you during the podcast, honor that. Write it down right now; what are you noticing? Notice your deserve statements when you’re justifying behavior. I deserve to, you know, have beer with the buddies. Huh, do I really want four of them to celebrate? So notice your deserve statements and always watch for the ending. “I deserve… I deserve this because…” Answer the because and learn what they’re telling you. Do some little detective work, like I do with my clients, and you’re going to find out what you are really wanting in your life; trust me. I’m gearing up for a free training this fall and if you’re interested, you’re going to be able to start registering to get those emails. I’m not going to send the training to my full list; you will have to register for it so that I don’t send it to people that just aren’t interested. So if you’re all interested in a free training this fall, I haven’t even named it, but I am designing it to be all about this coupling of mindset and wellness where we get so courageous in our lives and so clear about ways to take really, really good care of our bodies so that we can do these amazing things we want to do in our lives. Alright, have a great week and I’ll see you next week. Thank you for listening to this episode of Empowered Wellness for Leaders! If you enjoyed this episode and want to learn more, download our Free Video Series: Empowered Wellness Now. Visit dianamurphycoaching.com to sign up today!